The Mule Pro FX has only been available for a few short weeks now, and we already have our new plastic hard top / roof designed for it! Many DEALERS have yet to even receive a new Mule PRO FX as of yet. We already have our unit and have products designed for it! 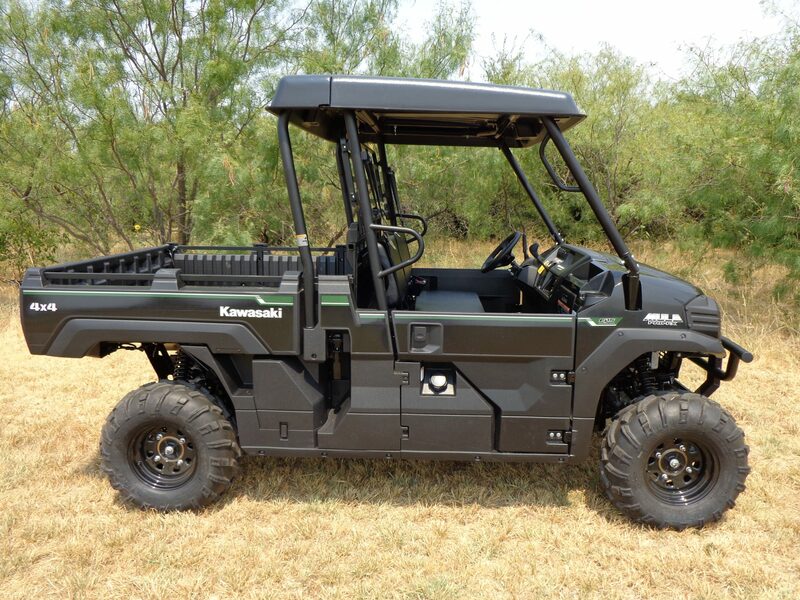 As we have done for almost 10-years, GR Manufacturing is yet again, the first company in the country to offer a specific, custom top/roof, for the all-new Kawasaki Mule Pro FX. Our top is highly engineered to ONLY fit this machine! It is not one piece of molded plastic from some other machine. This top is specific to the Mule Pro FX ONLY! 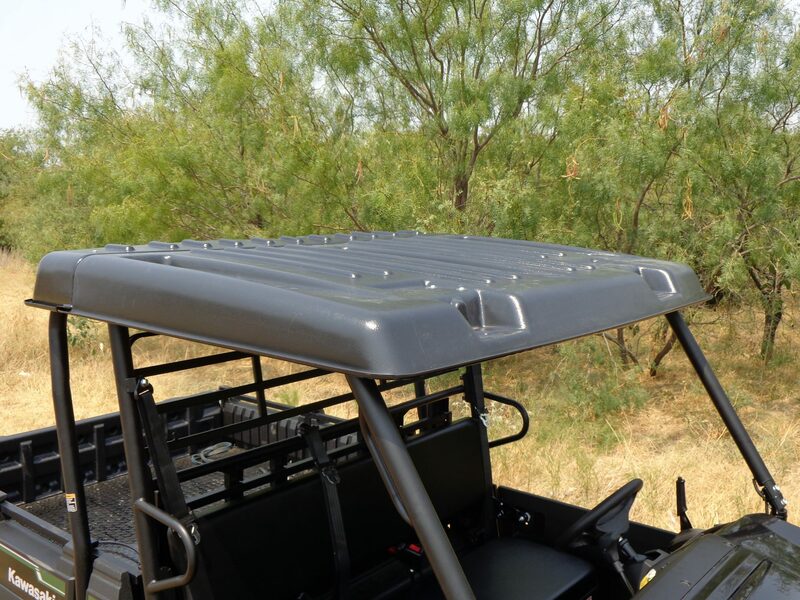 The world’s first open-trailerable plastic top/roof for the all-new Mule PRO FX! The factory offers a very thin, very flexible, and non-heavy-duty top as an option. With the GR Manufacturing Mule PRO FX hard top, you CAN tow the machine on an open trailer with our roof installed! Check the fine print on the factory data before buying one of those tops! In VERY small print, they tell you that do not recommend putting the machine on an open trailer. The factory themselves recommend putting the machine inside an enclosed when towing it. Who’s going to spend a small fortune on an enclosed trailer? Use our top and save yourself the trouble and expense! If the factory advertisements say you can’t tow your Mule Pro FX on an open trailer with their top? Do you think your dealer can warranty it if it blows off while on a trailer? This is NOT a ‘band-aid’ approach to creating a top for the new Mule Pro FX. Not to mention any names, but have you seen the only available option thus far? The OEM answer to a top for this machine? Simply give you the front half of a Pro FXT top, and bolt it on. That approach is NOT a good look, in our opinion. Who wants a top without a custom molded back section on the top? Who wants a top with holes in it, that were originally designed for another machine? We know we wouldn’t, so as on all of our products, our top for the Pro FX is custom to fit THIS SPECIFIC MACHINE! It is NOT simply a piece of a top for another machine! This top installs easily, and typically takes about 25-minutes to install, at the most. This design is based exactly on our other designs of tops. Close to 12,500 of our other tops are in service across the globe. This is a highly proven product, and again, the design is exactly the same design and concept of our other proven tops. 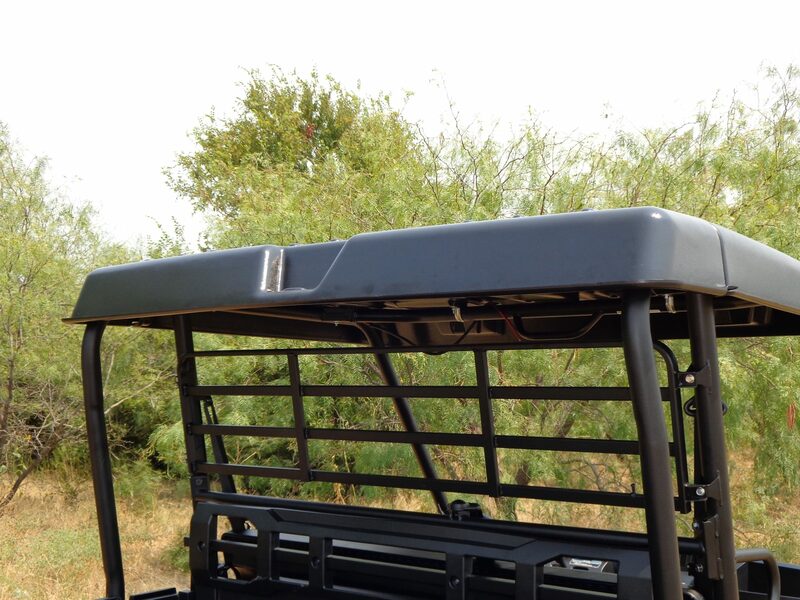 We simply made a new tool to mold a top / roof for the new rollbar design of the Mule PRO FX. This top will sell for perhaps $20-$35 more than the factory top. However, compare our top with the factory version. We bet you’ll choose the versatility and features of our top every time! The few extra dollars are required to produce a top of this caliber, versus the factory option. Tops are in production now. Molding and trimming will take approximately 2-weeks. This new top should be shipping to Kawasaki dealers around the country, in mid-September, 2015. Our top is a two piece design, for a reason: it will fit on a shippable pallet in two pieces, saving the Kawasaki dealer a lot of money in freight charges. The two-piece interlocking design will not leak thru the seam. We have a unique tongue and groove design, that prevents the two halves from leaking thru the seam. When water does enter this area, it is funneled to the outer edges of the top, to our integrated rain gutter which is molded aroung the perimeter of the top. This is a top-class roof and design.. Again, not to be redundant, but our top is CUSTOM to this model of machine, and is NOT a universal top! Ask most any dealer…..ask the US Military….ask NFL teams around the USA……ask your friends…we are a full-time manufacturer of after-market UTV products. If anyone else is bigger than us, we challenge them to debate that! We have thousands and thousands of our products in service around the globe. From hunting camps, to war zones, to farmers…..our products are all over the globe. We are PROVEN! Patent-pending as of September 1, 2015.